I recently completed an online workshop through Online Learning Consortium (OLC) “Exploring Hashtags for Learning”. We learned how to use hashtags, but also strategies to incorporate social media into activities and assignments to engage and involve students in meaningful learning. Following is the assignment I developed (using Instagram) as part of the workshop, but first I discuss the rationale to answer ‘why’—why use social media in learning activities first place? The next phase in course design, for online and face-to-face, will involve developing methods that integrate tools (e.g. smart phones) and applications (e.g. Twitter or other social media platforms) that students use daily, if not hourly. It’s inevitable if we want to make learning relevant, practical and effective. Not only is learning moving towards a student-centered model but students are now expecting to be contributors to their learning—to be involved in their education by contributing to course content. Yet I want to emphasize that using social media does not mean that learning is not rigorous. Going forward educators will need to determine how to leverage digital delivery platforms creatively to facilitate learning of course concepts and to foster critical thinking among students of all ages. Research suggests that student involvement leads to higher levels of learning and contributes to outcomes that include persistence, satisfaction, and academic achievement (Astin, 1985; Kruase, 2005). The research was published well before Facebook and Twitter, yet social media by the behaviours it generates, lends itself to involving students in learning when used as a tool, not as technology that teaches. For the workshop assignment in “Exploring Hashtags for Learning” I chose Instagram— mainly because I’ve little familiarity with Instagram in an education context and wanted to determine if it could be applied to foster learning. Instagram is a social media platform where users share images, typically their own pictures taken with their phone, through an Instagram app. Pew research shows that Instagram is the third most popular social media site after Facebook and Twitter, though Instagram has been growing exponentially. Though I don’t teach a course currently, I work with faculty to help develop active learning activities designed to engage students, and to ensure it aligns closely with one or more course learning objectives. To that end, I selected an art history course, which is similar to a course I worked on with a professor last year. Instagram lends itself well to an assignment where pictures can communicate concepts, and the comment feature in Instagram allows students to articulate which concepts are featured in their image and how. Developed for Undergraduate Online Course “ARC112: Art History Survey II”. Following is the background information on the course, its description, the learning objective the assignment is designed to meet, and a description of the activity. Course Description: This course offers an introduction to Western art history. It has two primary aims: to learn the skills necessary for visual literacy; and to acquire a broad knowledge of the important themes, movements, and individuals in Western art history. Attention will be given primarily to analysis of the form and content of work of art and to understanding how they fit into a historical context. Students are engaged by actively seeking out art forms in their everyday lives to post to Instagram and by engaging with classmates’ posts and commenting on them, which encourages students to apply course concepts. Following are the instructions for students. The course hashtag #ARC112; created specifically for this course. Providing clear, concise instructions for students is critical; doing so encourages students to focus on applying and learning concepts, and not focusing on the technology. The purpose of this activity is to apply concepts learned in the course about the movements in Western art studied in this course by analyzing art forms and determining the influence of movements and styles on the artist’s work. To accomplish this you’ll use Instagram, either your own account (see instructions here to create an account), or you can create an alternate Instagram account for the purpose of this course (see instructions here). You will take photos of art forms that represent or reflect a movement of art studied in this course. You can choose any art forms—sculpture, mural, paintings, street art, collages, etc. encountered in your everyday life which could be in a museum (though not necessary), in a park or public place, on campus, or other place. Post 2 images between week 2 and 5, of a work of art, sculpture, painting, or architectural detail, using the tag #ARC112 that reflect one of the art movements listed below. Each image must represent a different movement and include a caption that describes: the movement the work represents, how the work represents the selected movement, and why you chose it. Post a 3rd image in week 6 with the caption “What am I” in using our class tag #ARC112. The image can be partial image of the art form. The purpose of this activity is to have your classmates identify the art from, and determine which movement or style the art form represents. Engage with classmates who provide comments: giving hints or suggestions. Reveal the full image in week 8. Respond to 2 or more classmates’ “What am I” images in week 6 and 7 with your guess of what the art form is, the movement or style the artwork represents and how. This activity is worth 10 points—10% of your course grade. By searching the web and from my classmates in the workshop I learned of creative and unique ways that educators are using social media for learning. Yet, the most important factor when integrating any tool is considering the learning objective first, then determining which tool and activity will support learning and engage students. Astin, A. (1999). Student involvement: A developmental theory for higher education. Journal of College Student Development, 40(5), 518-529. How do you stay current, relevant and up-to-date with the new technologies in education? What Connected Educators do Differently has answers for educators looking to start and cultivate a professional (or personal) learning network (PLN) to stay current and connected. Following are key takeaways from the book and from two other resources that go beyond the basics of starting a PLN. Practical, concise and geared to the novice, the book provides advice and examples on how to start and build a personal network using digital tools. It focuses mostly on using Twitter and is specific to K-12, but the principles are sound and Twitter is a good starting point for learning how to connect and build a network. Within the eight chapters, each labeled as ‘Key Connector’ is a strategy outlining key principles along with examples from each author’s experience. The stories make it an engaging read. At the end of each chapter is an action plan — “Follow 5, Find 5, Take 5”. There are suggestions of whom to follow on Twitter, (Follow 5), a list of resources and how-to strategies for building a network (Find 5), and suggested action steps (Take 5). Two of the best chapters are chapter 6, “Relationships, Relationships, Relationships” and chapter 8 “Know When to Unplug”. In chapter 6 authors emphasize the value of face-to-face interactions and the strength of in-person connections. In chapter 8 the importance of disconnecting from technology is stressed. The latter is of great value; disconnecting from the screen is not emphasized enough in instructional resources on building digital networks or managing digital information. Developing a PLN can become all-consuming. The reminder is not misplaced. The following takeaways are from the book, from Jane Hart’s blog post “The Future of Work and Learning 1: The Professional Ecosystem” (2016), and from a journal article Scholars in an increasingly open and digital world: How do education professors and students use Twitter (Veletsianos & Kimmons, 2015). Expanding one’s professional network, building a PLN or professional ecosystem is a commitment and a choice. It isn’t driven by company or school-initiated professional development, but is driven from within—where individuals seek out learning opportunities and resources online or in-person. It’s a mindset where learning is pulled, gathered and curated based upon a person’s own learning needs and interests, which means each PLN is unique. Along with Mindset is motivation; developing a PLN or professional ecosystem needs both. Not surprisingly, authors emphasize that not all educators are, or will become connected educators. Developing and growing professionally and personally involves connecting and interacting with content—digital and physical, as well as with real people. The online platforms such as Twitter, Facebook or Slack that are used to ‘connect’ educators are the tools, the vehicles that bring us together. Granted, communicating online does require a unique set of skills to build and develop personal relationships, but the personal connection is still central to growing professionally. Jane Hart’s suggests that within a Professional Ecosystem there is a “personal performance support system” and “personal career coach”: people who are central to one’s personal and professional growth. One of the barriers to becoming a Connected Educator or developing a Personal Ecosystem is time. Authors Whitaker, Zoul and Casas offer a solution, “we must make time” (emphasis added) (pg 9). They acknowledge that most teachers and instructors are swamped, doing more with less. Yet their response is that in order to keep pace with constant change in technology and a society with access to an abundance of information, making time to connect and be connected is essential. And time is often personal time, outside of work hours. Though as all the resources stress, it takes consistent and concerted effort to develop a PLN but it’s worth it. I can vouch for this from my experience. I recommend What Connected Educators do Differently for people who are thinking about becoming connected, want to build a learning network but don’t know where to start. For those who already have a PLN and want to expand it, I suggest exploring Jane Hart’s site Learning in the Modern Social Workplace. Hart is a model of a connected professional and you’ll be sure to find some inspiration and ideas. For those wanting a quick fix, want to know how to get started on Twitter, this brief synopsis from the journal article on Twitter offers this pithy advice: “(a) tweet often, (b) follow many other users, (c) self-identify as a professor if accurate, and (d) continue using Twitter over an extended period. Whether one views this advice as gaming the system or legitimate participation in the community may depend on one’s own assumptions” (Veletsianos & Kimmons, 2016). Hart, J. (2013, May 8). The future of work and learning 1: The professional ecosystem, [Web log post]. Kimmons R., Veletsianos G. (2016). Scholars’ in an increasingly open and digital world: How do education professors and students use Twitter? The Internet and Higher Education, v 47: 3, 1, Pages 1-10. Whitaker, T., Zoul, J., & Casis, J. (2015). What connected educators do differently. New York, NY: Routledge. Can “Hooked: How to Build Habit-Forming Products” Help Make Learning a Habit? “Hooked” is about how to build habit-forming products…habit-forming digital products that is. I included “Hooked” on my must-read list to see if any of the principles discussed might apply to education—Learning Management Systems (LMSs) for instance or other ed-tech applications. Given our culture’s fixation with mobile devices, surely there might be some lessons to make digital education applications more compelling. Can educators create platforms or applications that ‘hook’ students into learning, where learning behaviors become a habit? If so, how? Hooked provides some answers—see below. Author Nir Eyal, entrepreneur and product designer describes the book’s topic as “behavioral design”. Behavioral design when applied to product development incorporates concepts of user experience, behavioral economics and neuroscience. Nir describes it as the intersection of psychology, technology, and business. His recipe for creating habit-forming products begins with ‘The Hook’ model. Nir Eyal’s “Hook” model encompasses four elements that products need to become habit-forming. Yet it’s not a guarantee for success, “new products can’t just be better, they must be nine times better” (pg 17). A trigger, either internal or external, leads to a behavior—it’s the spark that prompts action. Habit-forming products start by alerting users with external triggers such as an email, a website link, or an app icon on a smart phone, with the aim of prompting repeat engagement until a habit is formed. The trigger also tells the user of what to do next—to act. The action needs to be seamless; the user should be able to act with ease —without barriers. Action according to Nir, relies not only on ease of use but on principles of human behavior. It’s based on the premise that the user seeks one of three things: 1) pleasure in order to avoid pain, 2) hope to avoid fear, or 3) social acceptance to avoid rejection. Jack Dorsey founder of Twitter builds on this premise with his platform which is designed to solve a problem (communication, knowledge building), while addressing desires and emotions of its users (social acceptance via ‘likes’, retweets, etc.) (pg 39). What distinguishes the Hook model from the traditional feedback loop (embodied by the familiar model B.F. Skinner’s model where rewards are used to support behavior change through positive reinforcement) is the variability of the reward which creates a desire for feedback, motivating the user to seek it out. Traditional feedback loops are predictable; they don’t create desire according to Nir. Yet when there’s uncertainty to the reward or variability to the type of reward—the user’s interest is piqued Think of the variability of the reward structure with slot machines; they’re unpredictable. In an education context, Nir describes how Codeacademy uses variable rewards with symbols that benchmark students progress along with variable feedback that uses rewards to fulfill the student’s desire for acceptance and validation (pg. 89). The investment occurs when the user puts something into the product or service such as time, data, effort, social capital or money (pg. 7). The more users invest in the product or service, the more they value it—supporting the idea that labor leads to love. This investment concept is applicable to education—online courses for example where students contribute to course content (investment of time), complete course work (more time) and engage with peers (even more time). Image (above) of a screenshot from the YouVersion app which follows the four elements of the Hook model. The screen shot shows how rewards are built into the app, with the feature of ‘likes’ used by the community. After reading the case study of the Bible app, YouVersion in “Hooked” I could see the application of the Hook model, its relevance to learning contexts. The app provides a selection of bible study programs users can choose from based upon their needs. The app sends reminders and encouraging messages when readings or homework is due. When a message is avoided or missed, a red icon appears over the app, another cue. If more than two readings are missed, users receive a supportive message suggesting they consider a different (less challenging) plan. There’s also a virtual community, where encouragement from its members is another source of ‘triggers’. Rewards come in several forms. When a reading assignment is done for instance, the user gets a message “Day Complete” with a check mark on the app’s calendar. YouVersion is a success story. It’s the #1 downloaded Bible app with over 200,000,000 downloads. What if learning did become a habit, where students check into their online class daily, share relevant content with classmates or engage in group assignments willingly? The case study of Youversion is instructive, suggesting that the model concepts are applicable to learning scenarios, specifically to learning platforms and applications. Learning applications created thoughtfully and purposefully can support behavior changes that result in seamless learning, with few barriers and built-in rewards that provide variety and freshness that also leverage the learning community. Yet creating learning that follows the Hook model requires a different mindset, and commitment to create compelling learning with integrity and care that protects students, content and the process of learning. If you are looking for some light reading over the holidays or ideas for some good reads for yourself or others, look no further. I’ve rounded up some articles of interest and a couple of good websites that feature books-of-the year in an interactive and creative format. An article in this month’s Harvard Business Review “8 Tech Trends to Watch in 2016” written by CEO and founder of an international digital strategy firm, is not your average trends-to-watch for article. It’s cutting edge stuff. Of the eight tech trends only one, blockchain was somewhat familiar (used by Bitcoin, it’s a complex transaction system that enables buyers and sellers to engage in “trustless” transactions). The article describes up-and-coming technology such as drone lanes, glitches and algorithmic personality detection. Fascinating stuff. Insight: The education sector isn’t always on the cutting edge of technology, as we’ve seen with MOOCs, e.g. an innovative delivery system delivering education via traditional methods, yet there is potential in some of the technologies mentioned for application to education. For instance algorithmic personality detection might be used for student services such as career planning and academic support, bots as personal tutors, and augmented knowledge also known as digital telepathy which may make us question ‘what is learning’? The open journal, International Review of Research in Open and Distributed Learning (IRRODL) features a special issue this November with it’s a collection of papers that explore the MOOC phenomenon from the perspective of the higher education community in Europe. Though the majority of papers focus on the European perspective, a handful address themes universal to the MOOC phenomenon such as open access and course design. Despite the hope for more equal access to education through MOOCs, the empirical data show (section 4) that MOOCs potentially reinforce inequality. In this article we will give a theoretical background to explain why MOOCs are mostly used by more highly educated people (section 2) and stimulate a discussion on if and how MOOCs can contribute to equal access to education promoted by Open Educational Resources. (Rohs & Ganz, 2015). Another, “Dimensions of Openness: Beyond the Course as an Open Format in Online Education” argues that openness in education via MOOCs should not only be viewed as opening access to existing resources and courses for a broader audience, but as the removal of barriers for interaction and exchange (Dalsgarrd & Thestrup, 2015). Another paper with universal applicability is “Theories and Applications of Massive Online Open Courses (MOOCs): The Case for Hybrid Design“. This paper outlines a hybrid design model and discusses appropriate application as well the significant design challenges specific to MOOCs. Insight: The term MOOCs now covers a breadth of education programs that are not always open, massive or meet the definition of a course (with a start and end date). The articles in this special issue are a good representation of the current themes. Though I go further and suggest that 2016 will be the year of the MOOC reckoning, as alluded to in a recent post on the Ed Techie blog, “2016 – The year of MOOC hard questions”. I came across a couple of engaging, interactive sites by NPR, The Guardian and The Globe and Mail featuring best books of 2015 in various categories. These sites go beyond the traditional, static webpage; they invite the user to engage with the content. We’ll likely be seeing more of this interactive home page format in 2016, as according to Fast Company this is the new look of webpages. Speaking of books, I’ll be publishing “Seven Must-Read Education Books for 2016” by the end of the year. Stay tuned. Following that I’ll also share my views in a post on the ed tech trends that will affect education in 2016. Happy Holidays to all and thanks for reading and making Online Learning Insights happen by your continued reading and sharing! 1. Is This EdX MOOC Propaganda? “It’s propaganda” This course is “part of a larger campaign to export a way of Chinese governance ….China wants to be part of the world, but it doesn’t want to be part of a world where Western democracy and capitalism dominate” (Logue). An alternative perspective comes from a medical student in Tianjin who is quoted as saying, “Sure, it may be a bit like propaganda, but it’s something that’s being taught in every school in China…More Chinese universities should offer these kinds of courses because it gives the world a window into China.” (Hernandez). EdX when questioned about the course claims not to interfere with content, as long as course content is not unlawful or offensive it will allow the content on its platform. Insight: When reading the course description of ‘Introduction to Mao Zedong Thought’, it’s described as giving “learners around the world a rare peek into a course that millions of university students in China are required to take each year”. This statement is telling in itself; it states how history is presented to students in China, quite a different perspective from what is presented in the West. The MOOC provides an opportunity to view Mao Zedong rule through the lens of a Chinese student, and with the knowledge of other perspectives students will gain a deeper understanding into the political process and power structure within the country. Though the MOOC doesn’t provide other perspectives (based on student feedback), I’ve taken MOOCs that have also presented a one-sided perspective of an issue. One comes to mind—an edX course I took last year, Saving Schools: History, Politics, and Policy in U.S. Education, which presented a single perspective on public education and the reform needed. Content was drawn primarily from one source, an organization Education Next. Content primarily consisted of opinion essays from the Education Next publication, an expert featured in the lecture videos who also happened to be the Editor-In-Chief of Education Next, as well as a text-book chapters from a book authored by this same Editor-In-Chief of Education Next. Stephen Downes quoted in Inside Higher Ed says it the best “There’s no such thing as a neutral course,” he said. And now, “courses that might have been offered behind closed doors are offered for everyone to see.” He’s right. Personalizing learning is the tailoring of pedagogy, curriculum and learning environments by learners or for learners in order to meet their different learning needs. Typically technology is used to facilitate personalized learning environments. There’s been much written about personalized learning in education sector—it’s the latest trend in education and it’s making its way into higher education. The idea behind personalized education is customizing learning experiences by using academic data analytics, and moving from a one-size-fits-all approach to education to adapting learning experiences, curriculum or instructional approaches to individual students. Personalized learning appears most prevalent in K-12 and online education, but now universities have funding opportunities to expand initiatives into personalizing learning using adaptive courseware. This week the Association of Public & Land-Grant Universities (APLU) announced a grant available for six universities designed to help institutions ‘scale their adaptive courseware effectively’ —to improve education and help students learn (Wexler). In a nutshell adaptive courseware, is software that uses algorithms based on data generated by students to scaffold instruction. Adaptive courseware can be used in distance education, but the university association is focused on blended learning. Faculty members will learn to use new online tools but will continue working with students in a traditional classroom setting. The group wants universities to focus their efforts in lower-level, high-enrollment courses, or in courses with high failure and withdrawal rates. Insight: It appears ALPU’s focus is getting universities to implement adaptive courseware, and not on personalizing learning. There also seems a great emphasis on haste evidenced by the language used by ALPU—for instance in the two-page Grant Overview paper titled “Accelerating Adopting of Adaptive Courseware at Public Universties“, and in the second paragraph, “to speed post-secondary educators toward effective use of high-quality adaptive courseware“. The last statement does not lend itself to the process of a conducting a thorough needs-analysis or approaching personalized learning thoughtfully and strategically. Also of note, one of ALPU’s partners in the Personalized Learning Consortium is Acrobatiq, a provider of courseware solutions. Data has this marvelous capacity to show patterns of human behavior, tell stories and even predict what we are going to do next. It’s the premise of “Dataclysm”—the stories data tells about what we value, how we think and act. I chose the book as one of my 2015 reads because of the big mountain of data that education institutions are collecting; I wanted to get a glimpse into how data predicts behavior, to learn about privacy boundaries, and was hoping to get a glimpse into how data might help us design, develop and deliver better learning experiences for students. A tall order. Not surprisingly I didn’t find answers; but I did learn about the power that data holds and discovered a good report by EDUCAUSE that does have some of the answers I was looking for. The biggest takeaway from “Dataclysm” is the incredible potential data holds, which can translate to education sector. On its own data has no value, but with the right software data can inform, support, predict and help. Most organizations including education institutions collect mounds of data. Some is put to good use though according to the EDUCAUSE report the majority of data is used to satisfy credentialing or reporting requirements rather than to address strategic questions. And much of the data collected is not used at all (Bichsel, 2012). Education data is of abundance. Students generate a significant chunk. Every time a student logs-on to the LMS, school portal, or uses school software, printers, e-books, etc. data is collected. Every click, key stroke, time on web pages, links clicked are recorded. Rudder, author of the book and quote above, is also co-founder of the dating site OKCupid. He gets most of the content for his book from data on his site though he also draws from Twitter and Facebook. 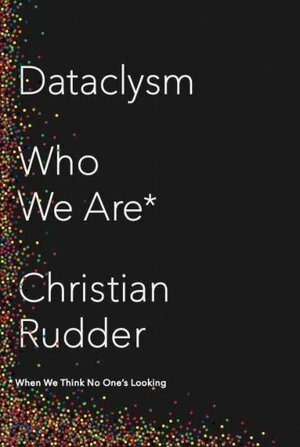 Rudder describes how he takes data, without identifying details such as user names, and analyzes it to create narratives that describe human behaviors. The book is full of stories the data tells about race, gender and politics, which at times was disturbing. Not the writing, which is witty and entertaining, but the results of his analyses. Rudder calls his work more of a ‘sociological experiment’, examining human behavior, values, even biases by looking at (online) actions, words, choices, link clicks, and ratings. ‘Dataclysm’ was interesting—not instructive but insightful. Since finishing the book I’ve recognized how, what many label as disruptive services, are data-driven. Uber for instance, the new taxi service. Its business model rests entirely upon big data. Uber uses complex algorithms to aggregate data into actionable info that quite literally drives the business (Marr, 2014). Another—a new email program by Google, SmartReply, can write email responses for us by using machine learning to ‘work on a data set that they cannot read’ (Corrado, 2015). Whatever that means. But the gist is, its BIG data behind it. EDUCUASE defines analytics as “a tool used in addressing strategic problems or questions”. 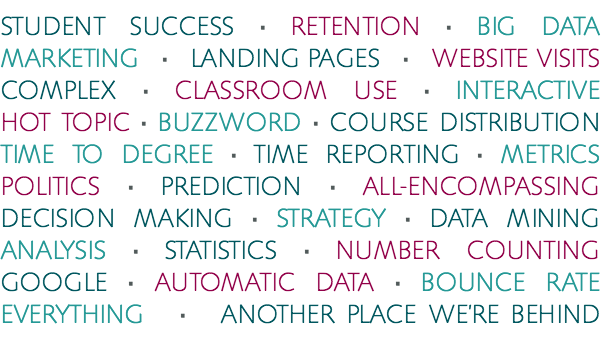 Analytics are typically applied to institutional data and learning or academic data. Yet it appears that the potential of big data in education is yet to be tapped. The field is broad, complex and there are numerous barriers as described by Bichsel. developing data models to designing and delivering alerts, dashboards, recommendations and reports. Though there are many institutions working extensively in learning analytics with the goal of helping students succeed and improving outcomes. One is University of Michigan who have helped create a standard that ensures third-party vendors (e.g. LMS providers) provide institutions with access to data generated by their students—not to withhold the data which can be critical for schools looking to use it to support and inform student success (Mathewson, 2015). Another is Purdue University who has done extensive work in academic analytics with its LMS program Course Signals (Research on Course Signals, n.d.). Rudder states in his book that we are on the ‘brink of a revolution—a data revolution‘. I think he may be right. The education sector may take some time to figure it out, but for those that get it right, it will be revolutionary.